My big knitting project at the moment is writing a book about highly-decorated fingerless mitts and mittens. These are my favourite things to knit and give as gifts. They are quick, easily adapted to suit the recipient, fun to pick colours for, and fun to make. I always hear from the receiver how much they love and wear them. The book will be packed full of patterns, examples and techniques but I also want to cover some related tips and techniques here on my blog. As well as show some examples that won’t make it into the book. 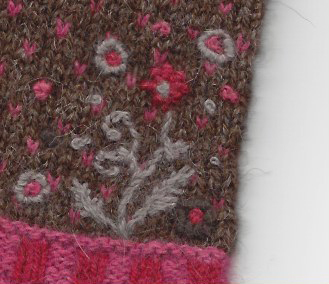 Small Fair Isle patterns make the perfect fabric for embellishing. The strands across the back of the knitting, make the fabric firmer, creating a good surface for embroidery. 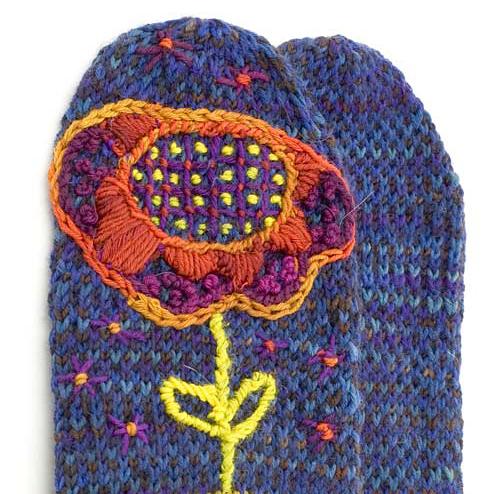 These mittens were made years ago for a good friend who was very ill and had cold fingers. They were a pleasure to make, giving me a small way to comfort and help her. I also enjoyed thinking about her as I chose the colours and decoration. 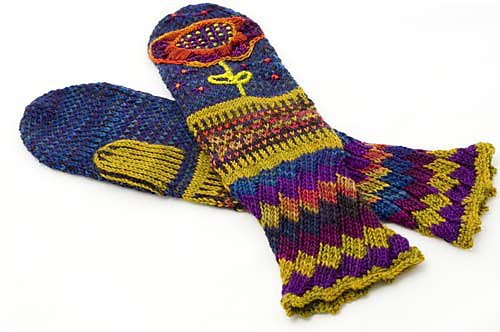 The background of the mittens is a simple check in two very closely related Wollmeise colours. These were one of my first attempts at embroidering on knit mittens. 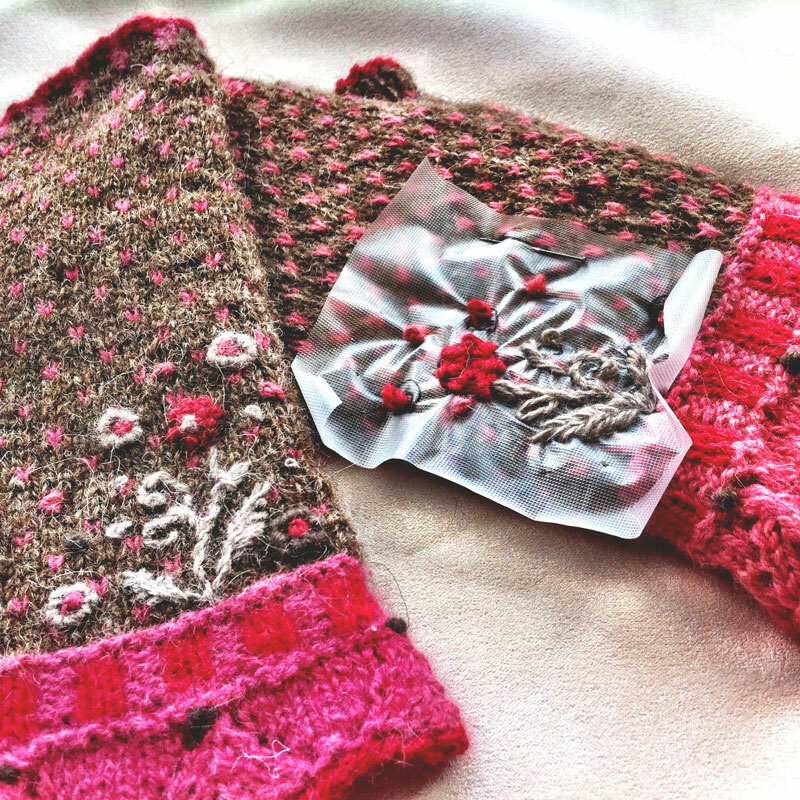 I used Wollmeise yarn to embroider as well as knit them. Now I would prefer a looser yarn for the embroidery. I think the Wollmeise looks a bit stringy as embroidery thread. Using hanks of cheap tapestry wool, from my local £ shop, gives me a great choice of colours and the embroidery blooms better on the surface of the knitting. I use water soluble embroidery film to duplicate the embroidery design onto my mitts. This is wonderful stuff – and cheap too. You can find it at craft shops or online. It is transparent so you can trace a paper design onto it with a pen. Either side is suitable for drawing on, which makes it easy to mirror designs. Because you can see through the film, you are able to move the design around on your mitts, to decide which is the best placement before pinning it in place. Sometimes called stabiliser film, it has the added benefit of keeping the stretchy knit firm, while you work. I don’t use a hoop since mitts wouldn’t fit or would get stretched out, the film provides the stability. 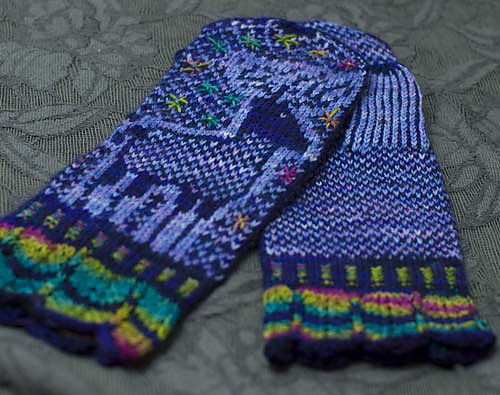 Another pair of Stranded colour work mittens in Wollmeise. The checkered background is decorated with embroidered stars. 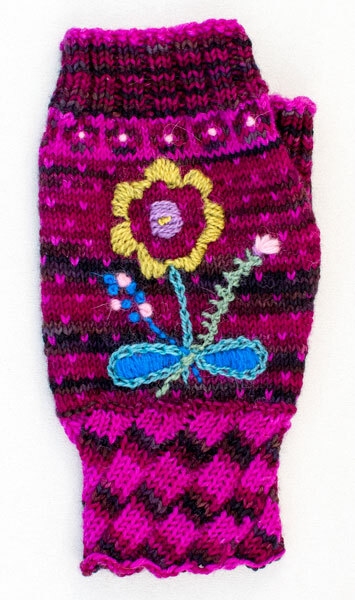 Looking forward to your book on mitten embroidery, as this is something I’m just beginning to do. Can’t wait to see some of your designs and ideas!